Hello there! My name is windxrunner, I came over from ECF. My DNA200 is inside of a 3D-printed enclosure based off of the Beta Box design with a few alterations, uploaded by slutlab to Shapeways. I'm using a FullyMax 900mAh 3s LiPo pack, the same one used in the Beta Boxes Evolv sent to the Beta Testers. I've had my DNA200 for 3 days now, and I want to start by saying I LOVE IT and my experience has been overwhelmingly positive from the get-go and I have had very few problems. I have noticed a few wonky things, so I made this thread to record them and get feedback, and also to see if anyone else has had similar issues. The first thing I noticed is that when in TP mode, the temperature will go a couple of degrees above what I set. So, if I have it set to 450F, when it's throttling back on the power it will cap out between 450F andd 453F, unlike my DNA40's (I have 3 of them) which all throttle back to exactly the set temperature. I believe my positive connection to be very solid, so I don't believe that is what's going on. Is this just the board being more accurate than the DNA40? Second thing, is I can't get my Charging Fields to display. When I have my DNA200 plugged into the wall or my computer it only ever displays the Default Fields. I have selected alternate fields to be displayed when it is charging, but they do not show up. Is there some way to turn these on that I'm not seeing? Lastly, I have also had some difficulty with some builds refusing to go into TP mode. Once I solved it by unscrewing the posts and screwing them back down to get a different, and possibly better, connection. One time I fixed it by "resetting" the atty by unscrewing it from the 510, letting it cool and screwing it back down. Another time I couldn't fix the issue so I put a new build in my atomizer and tried that, and it worked. Overall, these issues haven't really interfered with the board's operation too much and I'm very thankful the firmware can be updated. This has removed any amount of worry from my mind, as I'm sure any and all issues will be addressed by Evolv. Thank you for reading my post, and have a wonderful day! 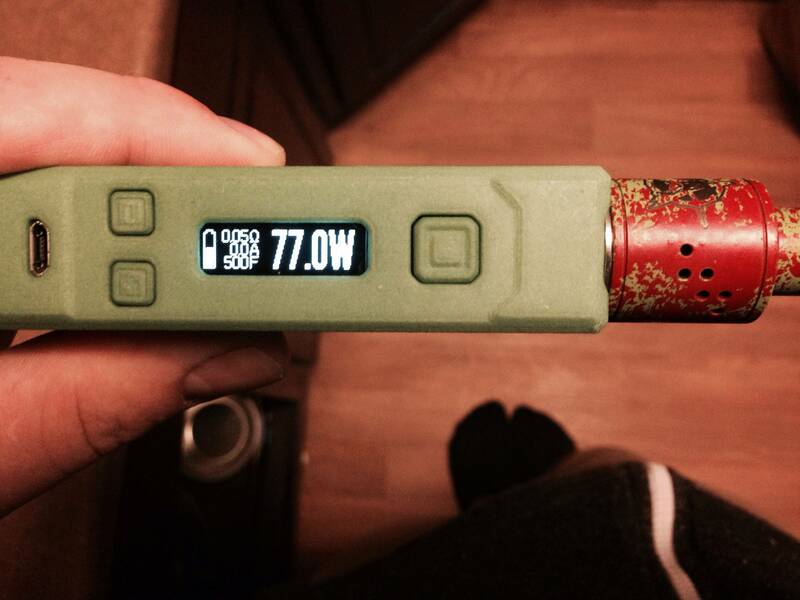 The control loop is different between the DNA 200 and the DNA 40. The 200 will control around the set temperature (using up to the set wattage), whereas the 40 will avoid the temperature limit at all costs. The 200 should be much more resistant to the pulsing that you could get with a 40 if you had a high setpoint and limited airflow or other low power requirement situations. It should be smoother, but the control error will be distributed on both sides of the setpoint rather than strictly below it. Do you have a charging brightness set above 0%? Try setting it to 50% and they should show up. It is important to remember that the charging fields only show up after the active time and the idle time have expired, so a bit more than a minute since you last pressed a button by default. What kind of builds are you running? It needs to see a rise from its cold resistance to 150F (at the set wattage) in order to kick over to temperature mode. Brief answers to some points, nice mod BTW. It it more accurate than the DNA40. The charging fields display for me when plugged into the PC and stay on the screen until unplugged even if has finished charging. With the switching to temp limiting could it be that you has resistance locked, or you could reduce the value of Ohm Lock range on the Mod tab and see if that works better for you. Thanks guys! It was a relatively easy build, tbh, the solder pads made soldering the thick wire a breeze. It's a very tight fit but I love the form factor. There is no real wasted space. Thanks for the info VapingBad.. If it continues to be a problem, I may mess with the ohm lock range and turn it up a little bit. But ATM, it hasn't been too much of an issue. The Charging Fields thing is what is really making me scratch my head. I wonder why it's working for you, but not for me? There's no option I can see to toggle the Charging Fields on or off that I can see... On the Default Field 2, I have it set as Battery Pack and Charging Field 2 set at Battery %, but when it's charging I still see the Battery Pack's total voltage. I tried changing them up and putting other options for the other fields but still no luck. Windxrunner if you save your settings file and post it here, we can probably figure out why charge fields aren't cooperating for you. Thanks, John! Here's my .ecig file. Set it to 50% and you should be good to go. It takes half a min or so to change after plugged in depending on the idle time or similar setting, not sure which one. Hey, VapingBad, thank you! I guess I just wasn't being patient enough and my idle time was set to 60 seconds. I changed it to 6 sec and after that amount of time my Charging Fields are displayed! windxrunner glad you got it all sorted you are not the only inpatient one the second DNA30 I did I snapped the screen, I replaced it and didn't think it worked at first as I didn't put the battery in long enough, I must have tried 5 or 6 times not wanting to fry anything IIRC I went over the solder again. Oh man, I feel for you. I wish you could have seen the immediate grimace that attacked my face as soon as I read the words "DNA 30" followed by "snapped the screen"... Man, that's a bummer. Luckily these new screens are replaceable! Idk about you but I get real excited when building a mod and if something that devastating happened to me in the middle of a build... I might just cry lol. Glad you eventually got that one sorted out.... It's an uphill battle sometimes but oh so worth it. The mods I've built are worth more to me than my most expensive pre-builts. LOL I thought it was a "right of passage" for every modder to crack at least one screen. Yep, I cracked one too. Ya learn real quick to be "gentle".